Tianjin/Sea-Gull started in 1955 with just 4 workers that were asked by the government of the People's Republic of China (PRC) to gather in a small workshop and build a wristwatch. The company is now the world's largest single manufacturer of mechanical and automatic movements. The four workers built a very few watches called Wuxing or ?? or 5 stars (I don't have one) and because of this success, the company began making watches on a larger scale for general distribution and sale to PRC citizens. Here's a borrowed picture of the Wuxing from Joel Chan's wonderful MicMicMor Vintage Watch site. This is an earlier Wuyi model, likely late-50s or very early 60s. The use of the older/simpler zuan symbol ? instead of the more complicated "jewel" character ? 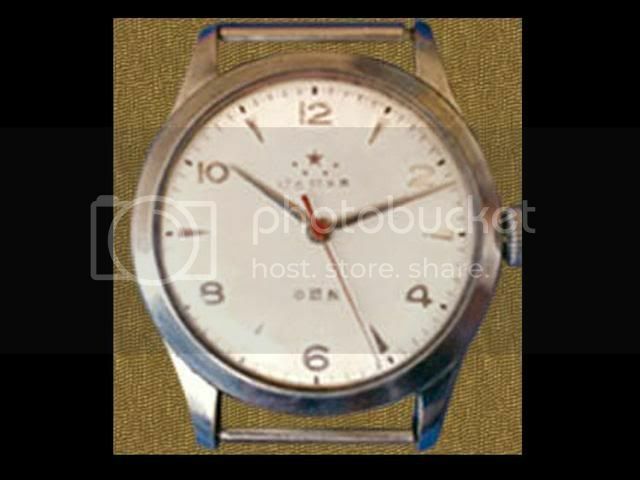 indicates before around 1964, same as with A-581 watches. "Shoubiao chang" means "watch factory", so: "Tianjin Watch Factory" and a nice example of the kinds of engraved casebacks common on vintage Chinese watches of the period. An earlier 17 jewel "no anti-shock" 62-A movement. Although a very reliable and well-finished movement in its own right, once the 62-A was adequately improved with shock-proofing, the 62-A was then renamed the ST-2 model. Very clearly based on an FHF 25 movement, the watch was most likely produced on machinery purchased from Fabrique d'Horlogerie de Fontainemelon as (unlike the less-than-honest practices of some Hong Kong based manufacturers in modern times) it was very much the practice of the PRC in those years to legally purchase designs and plants/production machinery like they did for the 1963 Air Force chronograph which I'll show later, here. and the movement was now shockproof, 18 jewels and anti-magnetic. Now designated ST2A, these were the last models in WuYi production history. 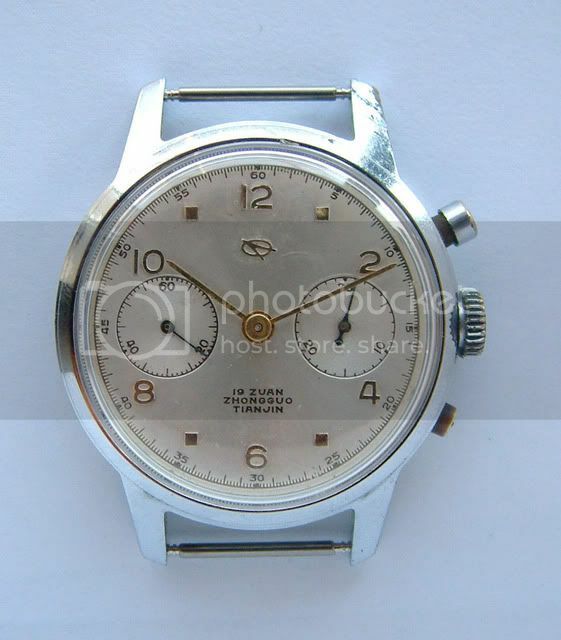 Meanwhile, in 1961, the Tianjin factory was asked to produce a chronograph for aviators of the People's Republic's Air Force (People's Liberation Army Air Force/PLAAF). Since such tooling did not exist in the country, the Chinese government negotiated for--and purchased--the designs and tooling for the Venus 175 chronograph movement which Venus wanted to sell so they could develop the 188 calibre. In 1966, 1400 Tianjin chronographs were provided to PLAAF pilots. This event would benefit Tianjin/Sea-Gull in an unpredictable way some 40 years later. At about the same time Tianjin/Sea-Gull was looking to expand the market for its own branded watches in the North American and European markets, a commemorative re-issue of the original PLAAF chronograph was being produced in China. As it happens, a couple of entrepreneurs asked for quantities of the watch as did a few European distributors and the "1963 Chinese Air Force Re-Issue Chronograph" became an almost instant hit, with most sellers running out of stock in fairly short order. Sporadic further issues come to market occasionally and the 1963 re-issue has done much to increase the visibility of Sea-Gull watches in the targeted markets. Meanwhile back in the 1960s (1966 to be exact) the Tianjin factory created the very first 100% Chinese designed and built wrist watches and re-named the product DongFeng (?? or "East Wind") which were produced until 1973. According to my observations, this watch runs about one second out per day on the wrist. :thumbright:. The movement was so well-designed and accurate that the Tianjin factory was one of a very few factories exempted from the late 1960s edict that had the vast majority of Chinese watch factories cease production of any movements of their own design in favour of what is known as the "Unified" or "Chinese Standard" movement. The movements in these upgraded models are hand-finished in what has become known as "Sea-Gull stripes" and, since the engraving is hand-done, these movements are each unique and sought-after by collectors. They certainly show the pride these workers took in their products. The ST5D was a first high point in vintage Chinese watchmaking. Very robust and accurate with a date mechanism but too late in the game to be as big a seller as the movement deserved. The next high point in Tianjin/Sea-Gull watchmaking was the very rare ST7 automatic wrist watch. Certainly, this watch owes a lot superficially to the Rolex "date-just" models so popular around the world at the time, but the clear "made in China" labelling, prominent Sea-Gull logo and hanzi date clearly show this is not an attempt to produce a fake or replica (and Sea-Gull was hardly the only watch to emulate the styling). This watch marks a very serious, but failed, attempt by Tianjin Sea-Gull to enter the export market with contemporary western styling and state of the art technical quality. The dial is marked 29 jewels, but both the movement and the rotor mechanism are marked 28 zuan (jewels), and 28 is correct. This watch contained a first class movement with micrometer regulation...that, as I noted, could not find a market: the Chinese either couldn't afford it or, if they could, were more interested in the extremely recent influx of cheaper or flashier, and often quartz, watches--and export market customers were not aware of the high capacity for quality of Chinese manufacturers. Evidently, fewer than 3500 of these beauties were made. This example runs less than three seconds out per day, more than 35 years after it was built and with no known regulating. Unfortunately, the movement is no longer produced. So, simultaneously having to deal with the double-whammy of a bunch of previously unavailable foreign models which were then entering the PRC Chinese market and the quartz revolution that was hammering mechanical watchmakers all around the world, Sea-Gull attempted to survive by producing a smaller, less-robust but also less expensive movement known as the ST6--a movement that is still common today in both mechanical and automatic versions, and that was Tianjin/Sea-Gull's first major world-wide money-maker (even though times stayed tough for quite a while). and something more controversial--an extremely rare Sea-Gull lookalike/homage of the wonderful Rolex Submariner that was built during the unhappy times at Sea-Gull during the early 1980s when the company was barely surviving and looking for ways to stay in business and keep its workers employed. This watch contains the automatic version of the ST6. It contains the very common Sea-Gull ST16 Movement (used by a huge number of manufacturers around the world) - Sea-Gull's entry-level automatic movement, known for being simple, robust and accurate with very little second-hand stutter -- and it handwinds and hacks. A very competitive movement in it's price class, the ST16 is even the ebauche used in the legally-Swiss Claro-Semag 888.
fascinating stuff, thanks for posting. do you know of a good source to pick up older chinese watches? i'm tempted to try out an auto or maybe a chrono. Autos are fairly easy to come by but vintage Chinese chronos are essentially impossible to find on the used market since only one vintage chrono (the 1963) was ever made. Sea-Gull ST5D autos turn up occasionally on Ebay and can also be found on Taobao but there's a learning curve in order to use Taobao (the instructions are here and it's not impossible, I do it all the time now, and I taught myself ). Newer Chinese affordable auto s can be found at Sea_Gull's USA site. Re-issue 1963s are mostly found used on the various boards although I hear tell that another batch of re=-issues might be in the works. The European sellers who had them (WatchUnique an WereldHorloges) are sold out AFAIK. If you're just looking for a relatively inexpensive and reliable intro to vintage Chinese autos, though, keep an eye on Ebay. There's one right now that looks OK to me. The price isn't incredible but it's not horrible either and it appears to be in good shape. Watch Talk - and TZ-UK - at it's very best! Thank you for an enjoyable and enlightening post. A very interesting and informative post, that will suprise a lot of people I expect! Aside from the Venus reissue the movements do look rather agricultural but a great insight into a largely unknown watch industry. I can't help thinking how the Chinese watch industry (albeit many years later) is similar to Seiko's history in the early days. I wonder if they will mirror their success? Could not express myself any better. Thanks for the post. It is very informative, and accompanied by excellent pictures. Thank you, I enjoyed this very much. I'll move it to "Classic Posts" when it starts to slide down the page. Very interesting read, thank you for taking the time to post. Thanks for posting this and the other pieces on Chinese watches. Something I knew nothing about. That's fascinating stuff mate - always more to learn about watches. I want to thank you all very much for your kind and appreciative comments, and I want to thank Eddie for his generous gesture of moving this post to the "Classic Posts" section. I'm new here but I'm very aware of TZ-UK's fine reputation so I couldn't be more pleased. I do like the Sea-Gull M185SP mechanical/automatic. Thanks for opening up a whole area of watches I knew nothing about. Excelent post. A real classic. Thank you for that information. A great read and one worth sharing. Tianjin/Sea-Gull started in 1955 with just 4 workers that were asked by the government of the People's Republic of China (PRC) to gather in a small workshop and build a wristwatch, and Tianjin/Sea-Gull is now the world's largest single manufacturer of mechanical and automatic movements. The four workers built a very few watches called Wuxing or 五行 or 5 stars (I don't have one) and because of this success, the company began making watches on a larger scale for general distribution and sale to PRC citizens. 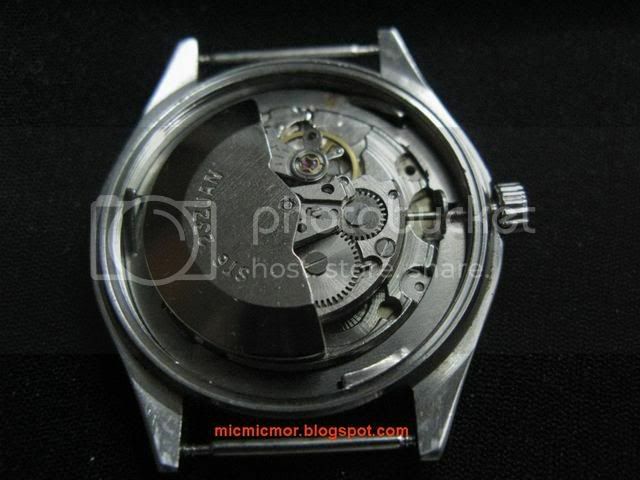 Here's a borrowed picture of the Wuxing from Joel Chan's wonderful MicMicMor Vintage Watch site. This is an earlier Wuyi model, likely late-50s or very early 60s. The use of the older/simpler zuan symbol 占 instead of the more complicated "jewel" character 钻 indicates before around 1964, same as with A-581 watches. This event would benefit Tianjin/Sea-Gull in an unpredictable way some 40 years later. At about the same time Tianjin/Sea-Gull was looking to expand the market for its own branded watches in the North American and European markets, a commemorative re-issue of the original PLAAF chronograph was being produced in China. As it happens, a couple of European distributors asked for quantities of the watch as did a few other entrepreneurs and the "1963 Chinese air Force Re-Issue Chronograph" became an almost instant hit, with most sellers running out of stock in fairly short order. Sporadic further issues come to market occasionally and the 1963 re-issue has done much to increase the visibility of Sea-Gull watches in the targeted markets. Meanwhile back in the 1960s (1966 to be exact) the Tianjin factory created their first 100% Chinese designed and built wrist watches and re-named the product DongFeng (东风 or "East Wind") which were produced until 1973. So, simultaneously having to deal with the competitive double-whammy of a bunch of previously unavailable foreign models which were then entering the PRC Chinese market and the quartz revolution that was hammering mechanical watchmakers all around the world, Sea-Gull attempted to survive by producing a smaller, less-robust but also less expensive movement known as the ST6--a movement that is still common today in both mechanical and automatic versions, and that was Tianjin/Sea-Gull's first major world-wide money-maker (even though times stayed tough for quite a while). 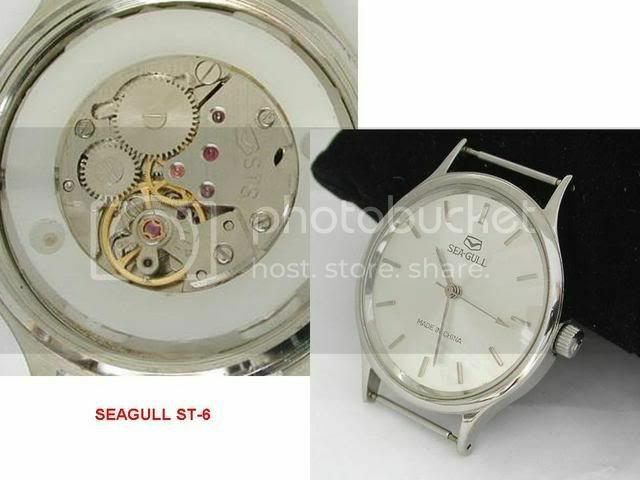 It contains the very common Sea-Gull ST16 Movement (used by a huge number of manufacturers around the world) - Sea-Gull's entry-level automatic movement, known for being simple, robust and accurate with very little second-hand stutter -- and it handwinds and hacks. A very competitive movement in it's price class, the St-16 is even the ebauche used in the legally-Swiss Claro-Semag 888. Thanks for another superb post which should convince the sceptics that parts of the Chinese watch industry really do pose a threat to the Swiss monopoly. I think the sceptics will have to see it first hand and up close, but that's OK...because they will. Great read! thanks for the research and writing it up! I was looking into one of the 1964 re-issues or whatever they are called, think I'm going to have to get one now! Thanks a lot for this very informative information, Ron. Vortex89, I believe you mean 1963 (Airforce) re-issue. I used to have one of those. The quality is fantastic! It is hand wound movement, and the case size, if I am not mistaken, is around 39 mm. It comes with solid and display sapphire caseback versions. The crystal is acrylic. Have you got one yet? That is a very interesting post. I wonder how long until they make 50%, 75%, 90%! I am sure they make many great watches but the fact that some much of what I own is made in China makes me want my watch to be different but I am sure I will get one eventually. where did all the pictures in your post go? Thank you very much for writing this exceptionally fascinating post :) Really good background knowledge and very educational, indeed ! China is such a huge market, my son rides a vespa scooter, recent press releases talked about vespa breaking into the domestic chinese market. Why, in one year the chinese buy more scooters that vespa has ever manufacured in its entire history! I had changed websites and so the links became broken. They're fixed now and all the photos have returned. thanks for sharing that. thats a very informative post. now i know where this brand has its roots. was considering getting a seagull tourbillon sometime back. its sparked my interest again.. It's posts like these that start me looking at watches with fresh eyes and will probably cost me as I feel the urge to buy one. Thanks for the post, a great read. As a newbie that was a interesting read, thanks. An excellent read as i really had no idea how many they account for - thanks!